See-Dub: Crazy Saturday, Part 2D: Taking stock. After lunch we headed behind the livestock exchange for Cow Camp, an orientation for young cowboys. First, we learned about life on the trail. "Cookie" told us about his chuckwagon and why he earned twice as much money ($2 per day) as the cowboys in their group. Then we moved on to the rope and saddle demo. We saw different types of rope and found out that horses are way smarter than cows. Because of that, horses are roped differently than the slower cows. We also got to see how to saddle a horse. Next up was the roping, herding and branding demonstration. While at Cow Camp, we were reminded of a couple of things. 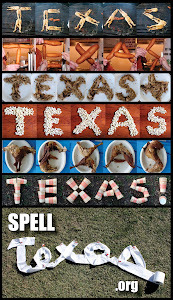 One: the non-Texans in the crowd LOVE this stuff! I do, too, because it's part of our proud history, but it was fun to watch the "foreigners" (from other states) get into the whole cowboy thing. The other thing we remembered: It is a nasty, nasty thing to see a longhorn poop and a horse pee! After Cow Camp it was off to the Cattlemen's Catwalk. This walkway took us across dozens of pens. We wandered around a little bit more after that, but we had to get back to the car by 3. Even with a fun run and a Stockyards visit behind us, our day had one more item on its itinerary.